A groom in Chongqing municipality nearly missed his own wedding after he got trapped inside a broken elevator on Sunday. 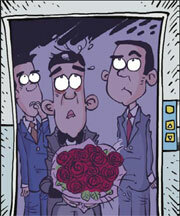 The man surnamed Zhang went to his bride's apartment building to pick her up when the elevator stranded him. He was freed after one hour and made it to his wedding on time.